Two photographs taken by Richard Klocke show a child's Mercury wagon converted into a wind wagon by Richard who lived on a farm near Green, Kansas. He built the wind wagon when he was eight years old. 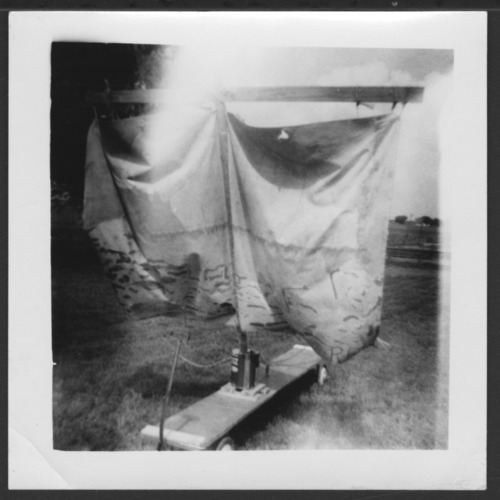 Klocke scavenged all the materials, the canvas sail was a discarded curtain from a fire at Green High School. His initials RK are visible in the lower right corner and an elephant is drawn on part of the sail. The mast was a piece of scrap lumber jammed into a Zero antifreeze can, which was obtained from the Skelly filling station in Green. The station was started by his grandfather and later operated by his uncle Elwood Branfort and his father Ivan Klocke. Richard Klocke operated the wagon by using one hand to hang onto a twine string from the corners of the sail and the other hand on the wagon tongue to steer from the rear like a rudder. The wind wagon would go up on two wheels when rounding corners. Klocke would travel west from his house on 21st Road over to the next farm where his friend Melvin Anderson lived and occasionally north on Stokes Street. He would walk home after going a long distance down one of the roads. The Mercury wagon is in the Kansas State Historical Society's museum.